The other day, after my posting some nice sailing and hiking pics, one of our readers, Bruce, asked if it were wrong of him to hope that we have some non-serious repair job to do so that we can post pics and details of the project for him to read on our blog. I replied that yes, it was most certainly wrong and that he should stop thinking thoughts like that! The truth is though, while I may not post about them, there are always things to do/fix/improve/maintain. Take our dodger for instance. For non-boaters, a dodger is the equivalent to the windshield on a car. As opposed to glass, it is typically constructed out of canvas-type material (Sunbrella ) and a see through plastic (It may not really be ‘plastic’ but I will refer to it as such. It comes in different grades and thicknesses and is sold under different names). ZTC’s dodger was very well constructed but as it happens, this plastic material gets brittle and yellows with age making its see-through properties a bit less than see-through. As you can imagine, that’s not so great for a windshield. Last year, when we visited St. Martin, we took our dodger into a sail loft / canvas shop and inquired about having the see-through material replaced. The proprietor basically blew us off saying that the job could not be done properly. Although we thought differently, we weren’t going to argue with someone who obviously didn’t want the work. We packed up our stuff, returned to our boat and have since sailed another entire year with the dodger in that condition. When we were in Trinidad though, a place where purchasing various boat-related products is quite easy, we invested several hundred dollars to buy the new material for the dodger in the hopes that we’d be able to get it fixed at some point down the road. We have been carrying it with us ever since. 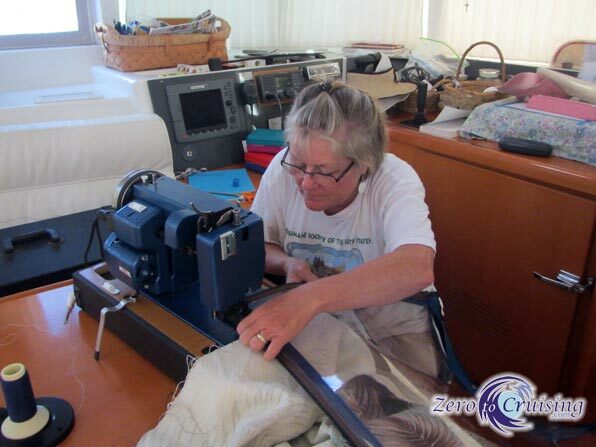 While we have a sewing machine on board and it’s been great for the various canvas jobs and repairs that we’ve had to do on our boat, we knew that it would not be up to this particular task. Because of that, we were hoping that one of our friends who have both more sewing experience and a much-beefier Sailrite sewing machine, would be up to helping with the job. Enter Donna, who not only met both of those requirements but was eager to help. While Kirk and I were busy yesterday afternoon, studying the anchoring habits of various visitors to the harbor 😉 , Rebecca and Donna were hard at work, disassembling the first of five sections of the dodger. Like any new project, there was a bit of guesswork and experimentation that went on in order for them to make it work but by dinner time, the first piece was completed and it looks perfect. First thing this morning they plan on resuming work on the project and we all anticipate that the next four pieces will go a lot more quickly. I do hope so because projects like this really put a crimp in our island exploration and fun time! This Sailrite sewing machine is a beast compared to the one that we have. Your body is your real sailing vessel! Have an idea. Add a rollup shade in front of the dodgers windows so when at anchor you can roll it down and protect the plastic. Also put little remains of cloth for ties… Just a thought…. Excellent idea. The sun kills everything down here. My dodger died too; not only was it yellowing, but with the colder temperatures up here, the older plastic split when simply opened–not even rolled–below 50F. Yup, I knew it was stiff, but what can you do when you can’t see? I had a canvas shop make me one to the tune of $1500 including installation. Ouch. But when I consider the cost of materials and labor, I understand. Starting over a year ago I started covering mine with just such an awning. It keeps the sun off, keeps the bird crap off, and keeps things cooler. Just last week I made a permanent one from Sunbrella. The side windows seem less critical so I don’t bother with them. Later I changed the rigging so that it is even further from the glass and added 2 grommets and a line around the mast. It’s was on there through Sandy and several snows; it barely moves and never touches the glass. These have been great too, both for heat and privacy. Easy. I’m starting some long-term testing of waxes and cleaners for Strataglass for Practical Sailor (I try to pick topics with relevance to Shoal Survivor). Though I have only my own anecdotal expereince and the words of a few canvas shops I’ve interviewed, the unanimous advice is that frequent application of INMAR products is the best bet. I know this; the skylight Strataglass on my boat is original, is always covered, and is still in excellent condition., though I’m on the 3rd windscreen. Ah, the real reason you wanted to meet up with them! 😉 Get the dodger fixed. Sailrite is an awesome thing for sure. We were at SDB one day right before lunch, and took bets on who would go through the channel and who would go over the reef. I won everything on a center console that nobody else noticed had Nauti on the side, or thought that was the name of the boat. I knew it was a Nauti Nymph rental. Sure enough, over the reef, outboard kicking up, load noises and yelling. They did limp across and anchor and come ashore, but were very very quiet. And left going very slowly, I am sure with a bent up prop. Yesterday, while watching a poor group of sailors on a Leopard 4600 try to anchor over and over, I saw something that I have never seen before. Right in front of us, one of their crew jumped in the water with a mask and snorkel on to check the anchor. As he was swimming back to the boat the remaining people on board obviously decided that they didn’t like that spot. Just when we was behind the boat they started motoring forward, staying just out of his reach. He is visibly gassed at this point and yells HELP… they had forgotten all about him! He rolls over onto his back, trying to float because he is in real trouble! Finally one of the other passengers notices, says something to the helmsperson and goes back to the stern to give him a hand. CRAZY! Ask and ye shall receive! Thanks, I appreciate not one, but two sewers with a beefier machine. Sewing that “plastic” must be tricky! PS… Drinks are on me. Thanks very much for the donation, Bruce. You rock! If you have ever visited our blog you know that I do canvas for our marina. I polish people’s dodgers and bimini windows for them as part of my canvas repair. Here are the products I use so you can get someone to bring some to you at some point. 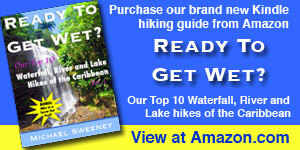 I have no affiliation with either of the manufacturers and you can get them other places other than Amazon. Thank you very much, Deb. I will look into those! How about a before and after pic? Too late. The old vinyl material is gone and I probably never took any pics through the bad glass as you couldn’t see through it.